Every Timberpeg home is designed from the beginning to be functional, energy efficient and sustainable. From the materials we use and the suppliers we partner with, a Timberpeg home is green, sustainable and energy efficient and it's why so many people have chosen to build with us for over 40 years. Some of our customers and their builders have gone another step to have their homes inspected and certified as being Sustainable, Green and/or Energy Efficient through various certification organizations including Energy Star®, EarthCraft House, and several others. 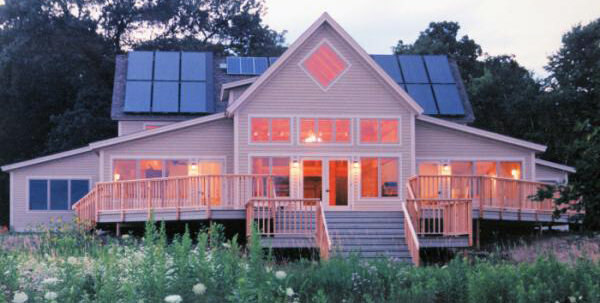 Visit our Energy Efficient, Green Homes Gallery to see some homes that have received various green building and/or energy efficiency certifications or who have simply taken some extra steps to make their homes energy efficient. Your Independent Representative or someone from Timberpeg will begin by talking with you about what you would like in your new home. They will want to know how the home will be used, your lifestyle, how you will likely "move" through the home, etc. Knowing this information will help us design a home that is both comfortable and functional for the way you live. Although many customers come to us with specific floor plans or photos of homes that they want to build, it's important that we understand not only your wants, needs and lifestyle but that we also understand your building site. Not every home design is suitable for every site. Where is the sun so we may take advantage of passive solar gain? What is the topography like? Are there any required setbacks? Your Independent Representative or possibly someone at Timberpeg will likely want to walk your site, or at least use some type of 3D mapping software to better understand your site prior to designing your home. Wood grows without using artificial energy, and although it must be harvested and transported, the overall use of non-renewable energy is less than concrete or steel. Most of all, wood is a durable building material. With sensible protection from the elements, wood buildings have lasted centuries. When possible, our Douglas fir comes from blown-down or small lot cuttings and our eastern white pine from local producers. Although most of our buildings use new wood, recycled timbers from older, demolished structures are available on request. It is not enough that Timberpeg practices environmental responsibility within our company, it is also important that our suppliers share the same principles that we do. To learn more about how the different components of your Timberpeg Package meet various environmental standards, visit the below links. Cut-offs from our manufacturing process are recycled locally, and made available at no cost to people who use them for fuel and a variety of crafts and other projects. The sawdust from the process is provided to local farmers. Metal strapping and other materials are gathered and recycled. Our tools are cleaned with citrus-based cleaners that won't harm the environment, and most of our shops' trucks and forklifts are powered with biodiesel fuel.